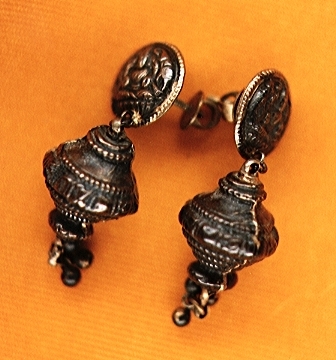 "Baba materialized these for me during my first trip to India in 1971. There were three of us; we had had 17 interviews in a row. On the last day he called in a large group of people. It was a long interview in which he talked about anything and everything. He manifested the earrings and told me that the figures on the earrings were Lakshmi, the goddess of all forms of wealth, and a conch shell. The conch shell represents the highest plane of consiousness. I was so surprised, shocked and overwhelmed. It was my first trip. I had seen many materializations during the trip, but I was really shocked when he materialized these earrings for me. I couldn't wear these earrings because the posts were too thick. They're like that in India. Earrings are symbolic of marriage in India. These earrings are symbolic of many things, but who can understand Baba and why he does what he does?"